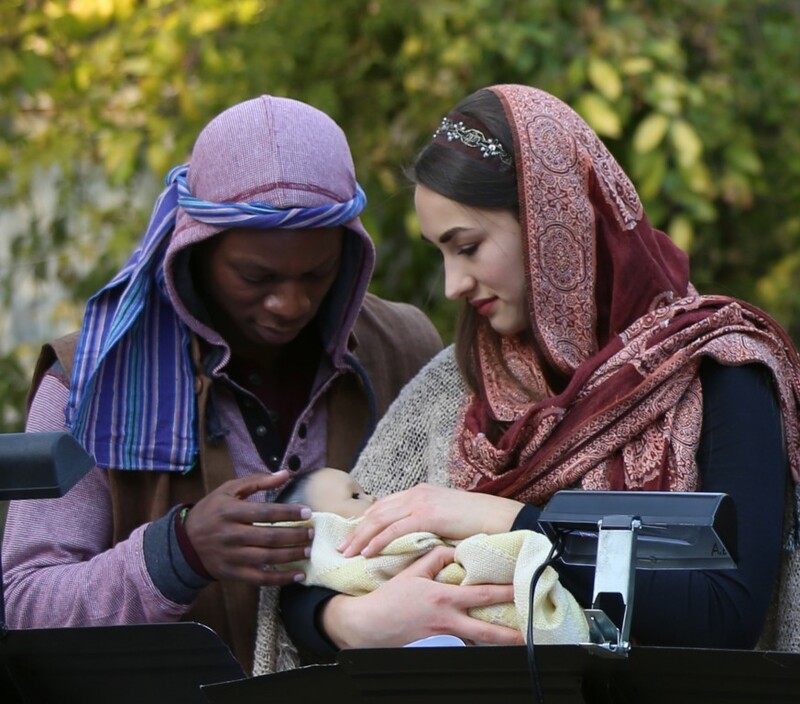 Joseph and Mary ponder the wonder of the Baby in their arms. Photo from “The Promise” reading last year. 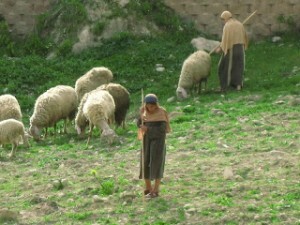 This post taken from the “Journey toward Bethlehem” series, first posted December 2011. I hope you enjoy this peek into what it might have been like to be one of those real people present the night Jesus came. Merry Christmas! I lay Him on Mary’s chest, warm and wet and wailing, and cover them both with my robe, and kiss her sweaty hair. And we laugh through our tears, and I think I hear the angels singing. Time and the census and Bethlehem itself fade away, and there is only us three, and firelight on the cave walls, and the sucking of a newborn mingling with soft bleats from the goat, and the Lord’s presence wrapping us so close I think I could touch Him. And then I remember I can. I dig in my bag for the swaddling bands and lay them out for Mary. And she bathes Him and swaddles Him with hands tender and trembling, enfolding His tiny limbs and fragile ribcage. Then I cover the hay in the stone feed trough with the cloth from my headpiece so she has a place to lay Him. I step back in the stable. 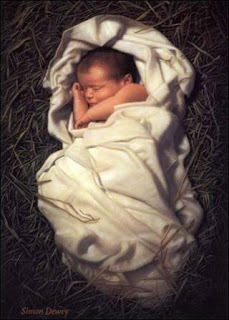 Mary has fallen asleep on her knees, her cheek resting on the manger, one hand on His swaddled form. I ease her back onto a bed of straw and kneel beside Him, resting my elbows on the stone trough’s edge. My baby looks up at me with bright eyes. Does He know—does He have any inkling at two hours old who He is and why He has come? I caress the tiny gripping fingers that have come free of the swaddling. Someday, before I am ready, He must show Himself to the world, to be embraced…or rejected. And that I cannot bear to think of, not yet. Joseph eases himself down beside me, and I nestle against him as he reaches to caress the baby’s head. I sleep again, vaguely aware of Joseph lifting Him from my arms to the manger once more. I wake to hurried footsteps and hushed voices, shepherds with scruffy beards and dirt-grimed tunics telling of angels and a heavenly song. And with a prick of my heart, I remember He is not just for us…He is for all people. And I nod, and Joseph lets them come. He turns His head toward us, and His mouth opens in a yawn. He closes it and stares at us with eyes dark and bright, little fingers reaching out. The backs of my eyes burn, and my heart throbs. The Lord has not forgotten us. He has remembered His promise; the Messiah has come. And He was not announced first to the rulers, or even to the priests and Pharisees. But to us, poor and humble as this little family.